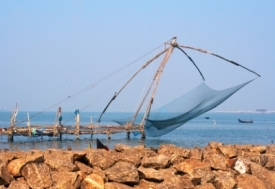 Cochin, the old Keralan spice city, is on the far southern tip of India in an area of dense tropical forests and extensive ridges and ravines. People from far-off lands have been coming to Kerala since ancient times in search of spices, sandalwood and ivory. Such long contact with people from overseas has resulted in the blending of various cultures and has given Keralites a cosmopolitan outlook. This state is one of the most progressive, literate and highly educated of all the states in India.